The first casualty of the Irish War of Independence on the IRA side was Volunteer Dan McGandy, who died 100 years ago this week. The 19-year-old failed to rendezvous with comrades of the Ten Foot Pikers, an active service unit of the day. He disappeared during a raid of grenades from Craig’s Engineering Works on the Derry quay. His remains were retrieved from the Foyle six weeks later. He became the first IRA Volunteer to die in Derry and the first recorded casualty of the War of Independence on the IRA side. Testimony from senior republicans of the day, and the removal of a British soldier from the river two days after McGandy’s disappearance, indicate he was killed in action in the raid on the grenade manufacturer. 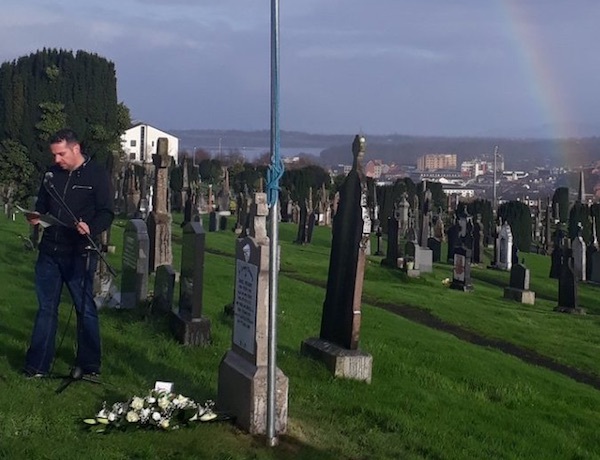 On Sunday republicans gathered at McGandy’s graveside in the City Cemetery to remember his part in the struggle for Irish freedom. A wreath was laid by Malachi McCormack and Sinn Féin’s Christopher Jackson, delivered the main oration. Councillor Jackson said the imprisonment of so many leaders after 1916 motivated young men like McGandy to join the movement. “Following the Rising many of the leading republicans in Derry were interned, leaving the struggle in the hands of young volunteers like Dan and by the time of his death in 1919 Dan McGandy was leading an active service unit called the Ten Foot Pikers,” he said. Mr Jackson explained how the young Derry man had likely been commandeering explosives with this unit when he lost his life. “It was the Ten Foot Pikers that discovered that Craig’s foundry in Boating Club Lane opposite Lawrence Hill was manufacturing grenades for the British Army and they set in place an operation that would see over 5,000 grenades safely in the hands of the IRA. The circumstances of McGandy’s death remain shrouded in mystery, however. “On January 20, 1919, an operation had been planned at Craig’s foundry but when Dan failed to show up at the Tech as agreed the active service unit stood down. To this day we don’t know why Dan was unable to meet his comrades but what we do know is that Dan arrived late and being in possession of the key to the foundry he carried out the operation on his own,” said Colr. Jackson. “Tragically the British Army had been alerted to the actions of the Ten Foot Pikers and ambushed Dan McGandy. Reports at the time claim that a struggle took place along the quay and a number of people were seen entering the river.